The 8588A Reference Multimeter is the world’s most stable digitizing multimeter. Designed for calibration laboratories, this long-scale high-precision reference features superior accuracy and long-term stability over a wide measurement range, with an intuitive user interface and a color display. The 8588A delivers reliable and reproducible measurements with exceptional performance suitable for primary level laboratories. 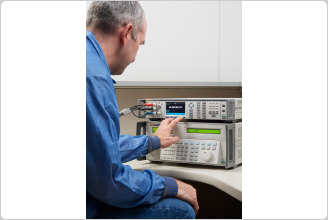 With more than 12 measurement functions, including the new digitize voltage, digitize current, capacitance, RF power, and external shunts for dc and ac current, the 8588A helps you consolidate your lab’s cost of test into a single measurement instrument. Its superb analog performance is augmented by Fluke Calibration’s new high-speed system design and the industry’s fastest direct digitizing capability, enabling significant throughput increase for many automated systems demanding a combination of the highest speed and best accuracy. The 8588A holds industry’s best one-year dc voltage accuracy of 2.7 uV/V at 95 % confidence interval, or 3.5 uV /V at 99 %, and best 24-hour stability of 0.5 uV/V (95 %) or 0.65 uV/V (99 %), enabling it to outperform other long-scale reference multimeters on the market. The 8588A further pushes the speed envelope by producing a stable 8.5 digits reading in a mere one second. The 8558A 8.5 Digit Multimeter offers a subset of 8588A functions and features at an extremely competitive accuracy and speed performance. Each model features a common intuitive user interface with an easy-to-navigate menu structure for all configuration and matching SCPI-compliant commands for an automated environment. In addition, both models support a minimum of 100,000 readings per second at 4.5 digits across GPIB, USB or Ethernet. The 8588A incorporates exceptional linearity, low noise and stability in the design. 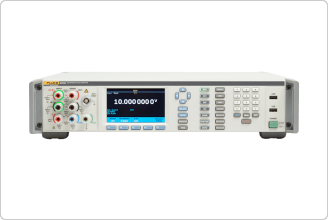 This best-in-class long-scale digital reference multimeter guarantees superior 3.5 ppm one-year dc voltage relative accuracy and long-term stability over a wide measurement range and functions. The 8588A contains the world’s most stable voltage references and attenuators custom crafted at Fluke Calibration. These precision components eliminate the need for daily internal self-calibration to compensate for drift when less-precise components are used. Autozeroing also becomes unnecessary because the amplifier offsets are ultra-stable. The 8588A achieves an exceptional 8.5-digit resolution reading in one second, two times shorter than the next best in class, which amounts to considerable productivity improvements. The 8588A is easy and intuitive to use. It is the ideal lab multimeter for metrologists and calibration laboratory managers who expect and appreciate a straightforward setup that quickly achieves the maximum performance of the instrument. The 8588A provides the most accurate true ac rms measurement available in a Fluke Calibration multimeter. 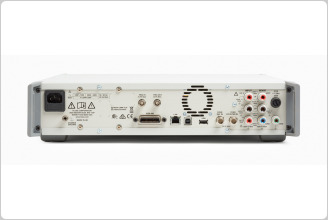 With a 5 mega-samples-per-second sampling analog-to-digital converter and an extraordinarily stable dc analog path, the 8588A achieves remarkable ac rms measurement performance that is ten times faster, two times less noisy, and more sensitive for low level signals than other instruments in this class. It utilizes digital rms calculations to maintain full resolution of a wide dynamic range of digitized signals, so you can see a wide range of measurements clearly. Rapid digital filters are more effective than their analog equivalents for faster settling. The digital filters eliminate the dielectric absorption on analog filters, commonly associated with residual slow-tail characteristics. The digital filters effectively shorten settling time to within 6 cycles of the filter frequency and less than 1 ppm of the fully settled value.This is up to 10 times faster than other long scale precision digital multimeters at low frequencies. Low noise is achieved from averaging the collected high-resolution digitized data and the inherently stable signal path. De-coupling low level signal sensitivity from temperature drift enables the 8588A to make higher accuracy low-level ac measurements. Therefore, temperature drift, offsets, and long-term instability typically associated with an analog rms converter are eliminated. The 8588A is the ideal lab multimeter. It streamlines the measurement process while eliminating misunderstandings, with an easy-to-access user interface in English, Chinese, French, German, Japanese, Korean, Russian and Spanish. An intuitive graphical display lets you easily visualize trends, histograms, complex waveforms, and statistics and perform routine metrology tasks quickly. You can perform both real-time and post-capture analysis for short-term and long-term stability, identifying and quantifying drifts, run-around noise and uncertainty analysis without the need for an external computer or software. You can also quickly visualize post-processed frequency domain signals of fundamental and harmonic amplitude and phase content. Some popular system multimeters have complex menu structures and unintuitive commands, while others lack any user interface, presenting barriers to training and operation. By contrast, the 8588A/8558A feature an easyto- access configuration menu that makes it easy to train new users. The front panel features many new usability improvements. Visual Connection Management™ output terminals light up to show which terminals are active, guiding the user to make the correct connections. The handles are over-molded for comfort and easy transport. USB host ports are placed both on the front and rear of the instrument. Use the ports to export data to external memory devices or simplify firmware updates. For remote communication with a PC, choose from Ethernet, GPIB or USBTMC connectors on the rear panel. 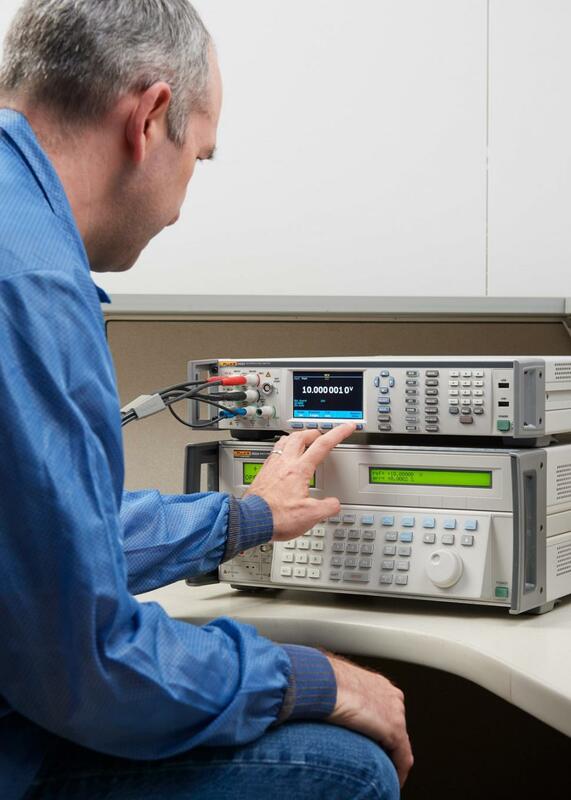 The 8558A/8558A provide full emulation of the Fluke 8508A Reference Multimeter and command compatibility of the Keysight 3458A Digital Multimeter via SCPI commands, making it an ideal replacement for these older instruments. Graphical display that enables instantaneous visualization of trend plot, statistical analysis, histogram and FFT. GPIB, USBTMC, Ethernet allows industry standard selection of remote interface. • USB thumb drive enables quick and easy data transfer to PC in .csv format. Programmable front/rear input switching with ratio measurement allows ratio-metric measurements between front and rear terminals in dc voltage, resistance, current functions with state-ofthe- art linearity, noise performance, superb transfer uncertainties. 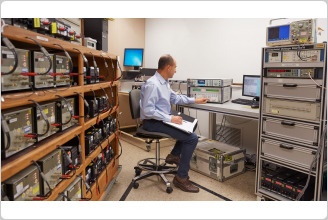 Capacitance and RF power meter readout from Rohde & Schwarz NRP Series expands the utility of 8588A in calibrating multi-product calibrators for improved productivity in calibration labs. You can enhance warranty protection with a Priority Gold Instrument CarePlan service package. 95% 1 year relative specification. Fluke Calibration guarantees to 99% confidence interval k=2.58. For 99%, multiply by (2.58/2).